On Monday morning (Oct. 8), Austrian daredevil Felix Baumgartner will attempt to break the world record for highest-ever skydive, leaping from a balloon nearly 23 miles above Earth’s surface. If all goes according to plan, Baumgartner will step into the void 120,000 feet (36,576 meters) above southeastern New Mexico early Monday, then plummet to Earth in a harrowing freefall that will see him become the first skydiver to break the sound barrier. After Baumgartner deploys his parachute and floats safely to the desert floor, he and the other architects of his mission — which is known as Red Bull Stratos — can celebrate breaking a skydiving record that has stood for more than 50 years. If everything works out on Monday, Baumgartner will also shatter the marks for fastest freefall, longest-duration freefall and highest manned balloon flight. But the daredevil says his leap is about more than just etching his name in the record books. "Red Bull Stratos is an opportunity to gather information that could contribute to the development of life-saving measures for astronauts and pilots — and maybe for the space tourists of tomorrow," Baumgartner said in a statement. "Proving that a human can break the speed of sound in the stratosphere and return to Earth would be a step toward creating near-space bailout procedures that currently don’t exist." Baumgartner's 55-story-high balloon is slated to launch from Roswell, N.M. at dawn Monday, weather permitting. Winds must not exceed 2 mph (3.2 kph) at liftoff to ensure that the balloon — whose material is 10 times thinner than a plastic sandwich bag — isn't damaged, Red Bull Stratos officials said. Baumgartner will ride aboard a custom-built pressurized capsule that weighs about 2,900 pounds (1,315 kilograms). A hard landing during a July 25 practice jump from 97,146 feet (29,610 m) damaged the capsule, and the daredevil's record-breaking attempt was delayed while his team made the necessary repairs. The capsule seen at the flight line during the second manned test flight for Red Bull Stratos in Roswell, New Mexico, USA on July 25, 2012. Red Bull Stratos is a mission to the edge of space to an altitude of 37.000 meters to break several records including the speed of sound in freefall. During the July 25 jump, Baumgartner reached a top freefall speed of 537 mph (864 kph) — about as fast as a commercial airliner. But while his capsule got knocked around a bit, the skydiver landed safe and sound. Baumgartner said he is nervous about Monday's leap from the stratosphere. But the 43-year-old daredevil — who has jumped from some of the world's tallest buildings and soared across the English Channel in freefall using a carbon wing — regards a tinge of fear as a good thing. "Having been involved in extreme endeavors for so long, I’ve learned to use my fear to my advantage," Baumgartner said. "Fear has become a friend of mine. It’s what prevents me from stepping too far over the line." 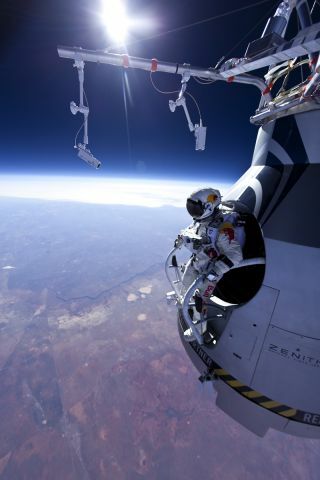 Red Bull Stratos has described the Oct. 8 attempt as a jump from the edge of space. However, space is generally considered to begin at an altitude of 62 miles (100 km), or 327,000 feet.